Do you think if The New York Times and the Washington Post and CBS and CNN and the rest of the nation's corporate-owned-and-operated news crowd had actually done their journalism jobs right, we'd be in such a mess? A senseless military bloodbath in Iraq. Environmental crises locally and globally. A crumbling dollar. And the crooks and liars still in command. Use it or lose it, eh? Vermont's one-of-a-kind Independent U.S. Sen. Bernie Sanders was recently the keynote speaker in Atlanta, Georgia at the annual convention of The Democratic Socialists of America annual convention. Did the American corporate media notice? "We’re not radical. You know who’s radical? 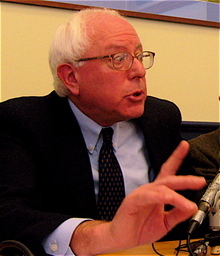 George W. Bush," Sanders said in his remarks. "Bush says we can’t afford money for food stamps... but we can afford $10 billion a month in Iraq, we can afford to repeal the estate tax. If anybody tells you we can’t afford health care for all or getting all children out of poverty... you look them in the eye and say Bernie Sanders is on the Budget Committee and it just ain’t so." Ever wonder why they made it the very "First," eh? Hmmm - - so - - who thinks Bernie wants to run for president?